During the last 10 years rock music has changed and it is not so heavy anymore as Linkin’ Park’s or Three Days Graces songs were. Therefore we will not be hearing the new Nirvana followers as the most played songs on the radio but rock music still finds its audience even though it changed its sound and was looking for new tunes and inspirations in folk, electro, and even pop music. Although the most popular songs on the radio are of the pop and soul genre, rock music is not dead and new bands of this music genre sell hundred thousand and more copies of their albums and perform in sold-out arenas. Teamed up in 2008 this group released their first music album in 2012 which became the most sold debut album since 2006. This foursome of alternative rock from Las Vegas can be proud not only of their songs being the most played works on radio but also of their successful sells and amazing tours. Before the production of the album which is titled “Smokes + Mirrors”, band announced about something that they had hidden in various places of Las Vegas. Soon fans started appear with clues about their newest album. Then the band to several fans had sent pieces of puzzles which revealed the name and the cover of the album. Fans Imagine Dragons usually compare to the Coldplay or U2. They play more acceptable and softer rock style music with hints of pop which is suitable for a wider audience. 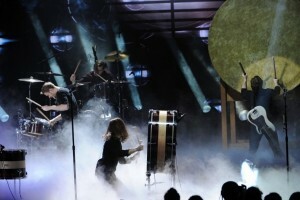 It cannot be forgotten that their single “Radioactive” in 2013 sold almost 8 million copies. Although this band came to the public light just two years ago, British duo had already released 4 singles, EP, and full studio album. In 2014 Royal Blood was asked to warm up Arctic Monkeys in their tour. After being supported not only by fans but also by famous musicians, such as guitarist of Led Zeppelin Jimmy Page, last year Royal Blood released their debut album. This album has no sounds of guitar – only drums and bass guitar, which is played by the lead singer, can be heard. Most of the songs of this album were recorded on the first try and with no help of earlier written sounds in order to create more natural environment where musicians can express themselves and put more of their energy to it. Fans of The Black Keys, White Stripes, and Arctic Monkeys should appreciate this band’s sharp, bluesy like sound with a mixture of 80s hard rock. Well-known band of four from London got together in 2007 and during these 8 years of their existence these people released three albums, were nominated for six Grammy awards, and visited the first places in various music charts. Even though the sounding of their last album “Wilder Mind” was different from the folk rock which made them popular (no banjo left which was the main thing distinguishing them from other similar folk projects), Mumford and Sons do not refuse to play their older songs at concerts. Most popular albums amongst listeners is “Babel” which in 2012 became the most sold album in United Kingdom – almost 159 000 copies during one from its release. It has their famous single “I Will Wait” which is still considered to be the signature of this band and one of the songs that made it to the tops of charts. In the music video of this song the video material from the concert at the Red Rock amphitheatre is used. Super band (bands called like this are when members were famous before the band has formed) called The Dead Weather led by famous Jack White, leader of White Stripes, who rejected the position of solo guitarist and usually is sitting behind drums or doing the job of vocalist, and vocalist of The Kills Allison Mosshart. Together with them play bassist of The Greenhouse Jack Lawrence and multi-instrumentalist Dean Ferrita from the band Queens of the Stone Age. They got together in 2009 and were active only for two years during which they recorded two studio albums and one live album. After five years of silence, this year they released an album “Doge and Burn” and earned all critics and fans praise. White Stripes fans should easily accept this project of Jack White even though that is not a duo of drums and guitar they still have plenty of energy and a wellspring of blues and garage rock which will capture the attention of every listener. Band nominated for Grammy award stopped its activity 3 years ago but debut album released in 2008 does not disappear from charts of favorite albums of folk rock fans. Vocals, nostalgic songs, and music of many instruments for most reminds of the 70s music. In very truth founders of this band were childhood friends Robin Pecknold (vocal and guitar) and Skyler Skjelset (guitar and mandolin) who in their early days listened to Bob Dylan, Neil, Young, and of course The Beach Boys. Second drummer of the band Joshua Tillman after the separation of the band started his solo career after the pseudonym Father John Misty and recently released an album titled “I Love You, Honeybear”. In 2013 band uploaded a photo of a microphone, computer, and guitar to the social media and in this way created waves of fans getting excited about their new maybe upcoming album. After several months this picture was deleted with no further explanations. Fleet Foxes will be perfect for those who like soft, folk of Bon Iver style, music inspired by 70s, and psychedelic rock. British indie rockers who released their debut album in 2007 call themselves symbol ∆ (name of the band is a combination of alt-J which is a symbol of a triangle when pressed in an Apple computer) and in their discography have only 2 albums although their music videos on YouTube are being watched by tens of millions of people, songs used in various movies and television series. Their second album “This Is All Yours” reached the tops of United Kingdom’s album charts and was praised by critics. Together with it band created an application for mobile phones which allows listening to this album in selected areas. alt-J is known for its minimalistic mixture of guitar with typical indie vocal and electro music. Fans sometimes call them the new Radiohead. Members of alt-J met in the University of Leeds where they started playing and recording songs in empty colliders of school until in 2011 they were recognized by the record label and with their help released their first album. Another super band, fully formed in 2009, Them Crooked Vultures for a lot of people sounded like an unrealistic joke: it cannot be right that one band would have members like Dave Grohl from Foo Fighters and Nirvana, drummer Josh Homme from Queens of the Stone Age, and bassist of Led Zeppelin John Paul Jones. Trio made one album, played several concerts, and left their fans of wanting more. Them Crooked Vultures play hard rock with elements of blues and psychedelic. Album is full of interesting rhythms, guitar solos, full specter of keyboards played by John Paul Jones, and energy. Their only album earned praise from critics and of hard rock music fans and even though it is sometimes criticized of being similar to the music of Queens of the Stone Age, it stays as a good proof of collaboration of these three amazing musicians. Leader of this band and a self-taught multi-instrumentalist Brittany Howard from her early childhood wrote lyrics and music. In school she met guitar player Heath Fogg with whom she listened to their favorite music and later started regularly playing in the grand-grandparents home where they met their drummer Steve Johnson. In 2009 when the band was fully composed, Alabama Shakes started playing in bars and club where they were noticed by ATO Records and signed their first contract. In 2012 Alabama Shakes released an album called “Boys & Girls”. It was nominated for three Grammy awards and its single “Hold On” became one of the biggest rock music singles of the year. Band plays rock music with blues and soul elements and its leader Brittany Howard’s melodies performed by guitar, vocals of Nina Simone and Janis Joplin distinguish Alabama Shakes from other groups of this genre. Anne Clark, which released her first album in 2007, has the Midas touch. It does not matter if they are solo albums or a collaboration with Talking Heads leader David Byrne, an album titled “Love This Giant”, or backup vocals in the Swans album “To Be Kind” Anne knows what has to be done in order to charm a music lover looking for fresh sounds. From the beginning of her career she already released five albums and with her music traveled around the world. Music of St. Vincent can be described as indie rock with strong elements of glam rock, pop, and electronic. When the unknown band from Australia released their album “Innerspeaker” in 2010, most of people did not believe that these psychedelic rockers would become popular in the whole wide world. Their second album “Lonerism” showed the world that music of guitar rock is not in the past. The same can be proven by the thousands of fans and sold records. Leader of the band Kevin Parker not only creates the biggest amount of the music but also records and produces it. Probably one of the best songs of theirs is “Feels Like We Go Only Backwards”. Mixtures of vintage synthesizer, 70s drum solos and vocals are the reason why John Parker is sometimes called the long lost son of John Lennon.